Conor McGregor during his bout with Dennis Siver. The Dublin fighter could earn up to €1m annually from endorsements as world champion. The Irish fighter made light work of Dennis Siver at UFC Fight Night 59 to defeat the German in two rounds on a night when Paddy Holohan and Cathal Pendred also enjoyed victories. UFC President Dana White has said that McGregor and Aldo will square-off in a high-profile title bout in Las Vegas this May. While no date was specified, Saturday the 23rd looks likely and McGregor's profile is set to soar even further both at home and abroad ahead of the mouth-watering contest. “Conor McGregor is now very much a national star as well as a recognisable face of UFC," Mick O'Keeffe, CEO of PSG Communications told Independent.ie. 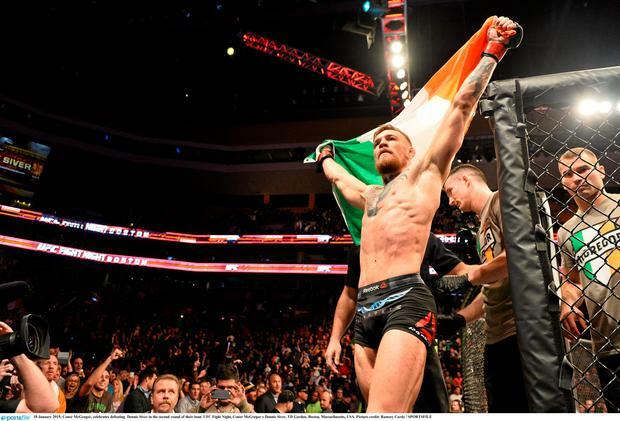 "There is no doubt his huge Irish following is helping his marketability in UFC circles. His earnings may still be relatively minor when you compare to the likes of Rory McIlroy, Lionel Messi or Cristiano Ronaldo, but his potential to earn big in the next 12 months is huge. His fight earnings are still low, but with a big date set for Jose Aldo in Vegas, his start will only rise." UFC president Dana White has said that the Dubliner is "the most marketable fighter in the world" and last week McGregor announced deal with leading sports goods manufacturer Reebok. A rapidly growing sport, UFC is still someway off the major established sports in terms of endorsements and sponsorship, but McGregor's "box-office" quality" will ensure that he can expect a significant increase in earnings should he get the better of the 28 year-old Brazilian Aldo. 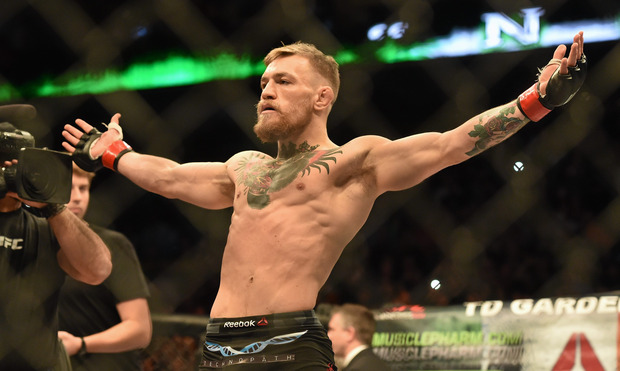 “McGregor is an astute business man and knows his value and his time has come," O'Keeffe added. "In a recent PSG survey, he is in the top 5 most admired Irish Sports stars, behind Katie Taylor, Brian O’Driscoll and Rory McIlroy but he is still relatively new to the scene but if he can become a champion, he will become even more of a star both in the US and here." By comparison, PSG estimated last year that Rory McIlroy's commercial deals are estimated to be worth €20m - €25m per annum, but should rapidly increase over time as sponsors trip over themselves to be associated with him and win bonuses kick in. He could earn in excess of €40m alone in commercial partnerships per annum in the coming years. McGregor quickly turned his attentions on Aldo last night in the octagon, taunting the Brazilian that his reign as champion will soon come to an end. "Hold on and I will get my spit bucket," he said. "I am going to give him (Aldo) my spit bucket so he can spit clean my belt and bring it back to me when I win." Katie Taylor hails Conor McGregor as an "inspiration"
Conor McGregor to Jose Aldo: "I am going to give him my spit bucket so he can spit clean my belt and bring it back to me when I win"